Posted in: Monthly Updates, Weekly Post. Tagged: august, cars, negative, net worth. 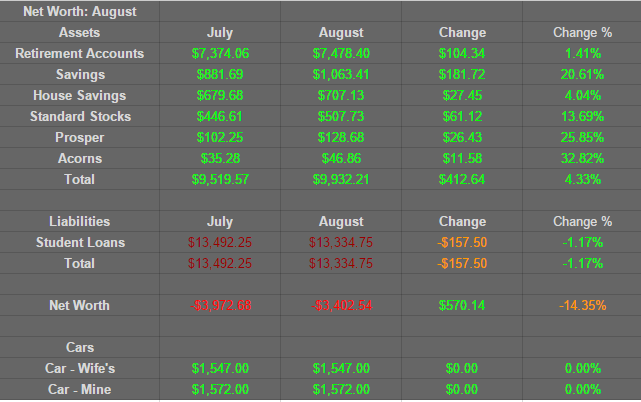 After a few conversations from some friends, I’ve switched up my net worth tracking. I consolidated a few things and removed our cars (although I’m still tracking them). Sadly, this means we go back down to negative net worth for the time being. Not much of a change last month. Here are a few thoughts/notes. House Savings: Sucked. The new furniture we bought last month was taken out of this month’s budget and my wife’s car had some issues. This means hardly any money for house savings. The good new? We will be putting 1.6k in there in September. Acorns: I decided to no longer deposit into Acorns. I love the idea, but right now I’m tracking every dollar. Trying to figure out how to budget for small amounts of change leaving was hard. Starting next month, I will likely roll this into Standard Stocks.